It’s the height of the holiday season and I’m definitely savoring it! 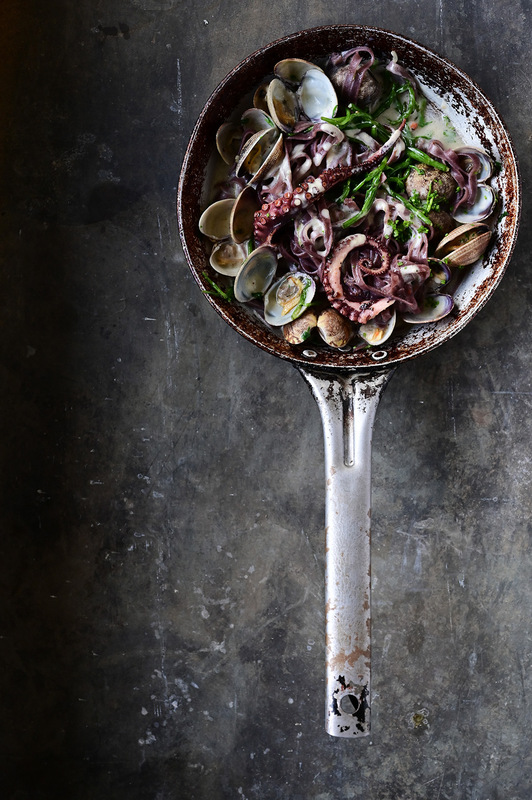 The annual New Years’ chaos is in my near future, but in the mean time this dark pleasure awaits – creamy garlic black pasta with clams and squid is as easy as it gets for an impressive dish to treat yourself or your guests. 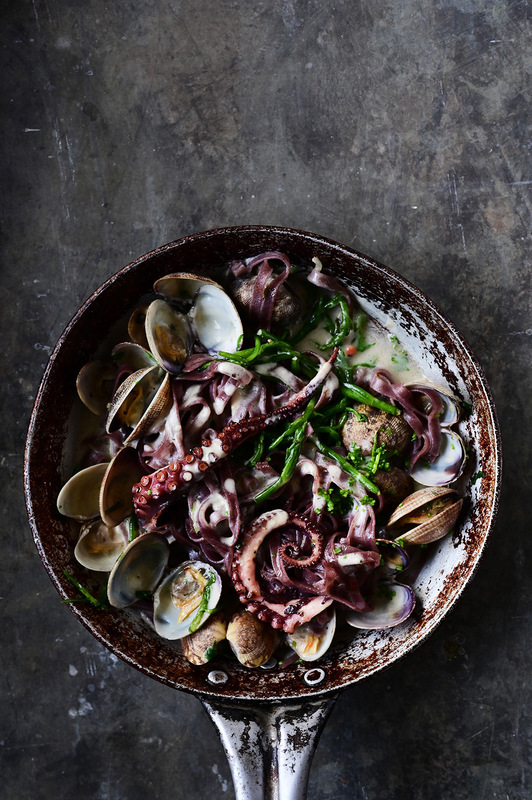 The pasta is tossed with fried squid and clams, accompanied with samphire and chili flakes, nesting in a pool of garlic sauce infused with herbs. The sauce is creamy yet completely lightweight and extremely silky. Your tastebuds will find an excessive happiness in the delicate flavors of this black pasta. It enhances this dish both visually and in terms of flavor. Enjoy, I hope you have some exciting New Year’s plans with friends and family, hopefully of which will involve delicious food! Bring a large pot of salted water to a boil. Boil the pasta until al dente, drain. Rinse the clams in cold water. Heat olive oil in a saucepan, cook garlic and shallots until soft. Add thyme and oregano, stir and pour in wine, boil for 3 minutes. Add broth, season with salt and pepper, cook for 5 minutes. Add cheese spread, stir and cook over low heat until the sauce thickens. 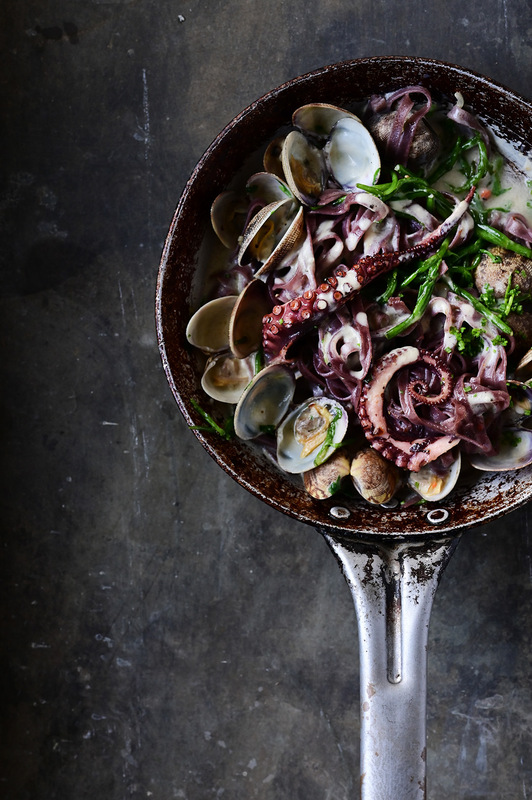 Heat olive oil in a large skillet, cook the shallot until soft, add the squid, fry until golden brown. 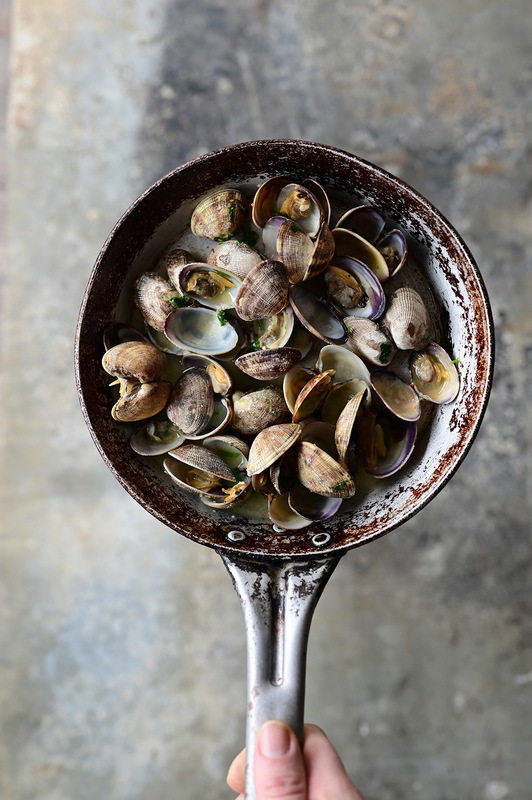 Add clams and parsley. Pour white wine and cook for 3 minutes, add samphire and butter. Boil for another minute, stirring constantly. Season with pepper. Combine with pasta and garlic sauce, sprinkle with chili flakes. Enjoy! You have just reminded me it’s ages since we had samphire. I must look out for it next time I am shopping. My wee boy loves it. it’s so good with seafood, isn’t it?! Enjoy!! Love your photographs. They look dark and brooding, but in a thoroughly delicious way 😀 I haven’t had samphire in a very long time, but it’s such good stuff. thank you so much for your nice compliment!! and yes, samphire is so good! Something I don’t eat very often so that’s probably why it tempts me the most. I must admit I am rather distracted by your photography board. It is rather nice! Great shots. Thank you so much for your nice compliment Jacqueline! This is such a pretty dish! I do like samphire and it goes so well with seafood, although I can’t eat the shellfish due to allergies I wish I could. This recipe made me crave for some seafood pasta. Never tried the black pasta over seafood. Will definitely make some of these this coming weekend. Thank you for sharing. Hope to read more. thank you! hope you enjoy this recipe.